They grind up the hops to release the oils - the use the hops the same day the grind them up! 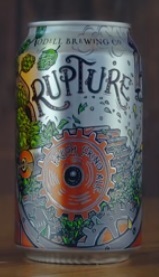 Rupture was born out of our obsession with getting the most out of each and every hop. In fact, we built a machine in our brewery to incorporate a unique fresh grind process. By grinding the whole hop we “rupture” the lupulin inside – releasing the oils that give the beer its flavor. And what we grind that day we use that day. Leaving you a beer that’s fresh, aromatic, with a bright hoppy character.